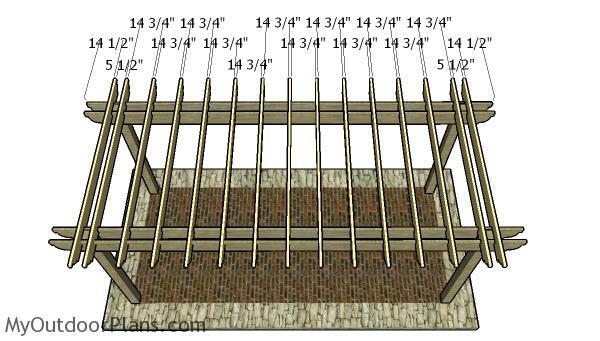 This step by step diy project is about 10×20 pergola plans. 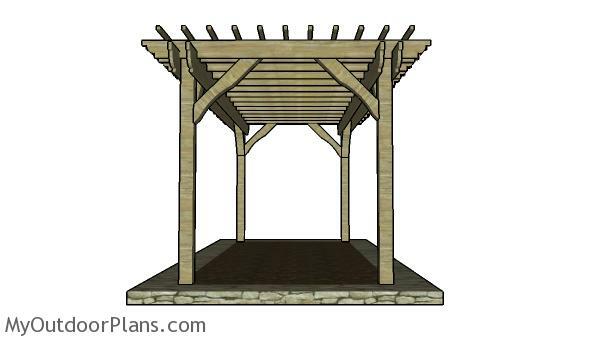 This is a rectangular pergola with a roof size of 10’x20′. The posts are made from 6×6 lumber, the double support beams are made from 2×10 lumber and the shade elements are made from 2×8 lumber. Take a look over the rest of my woodworking plans, if you want to get more building inspiration. The first step of the pergola project is to layout the posts. Use batter boards and string to layout the location of the posts. Apply the 3-4-5 rule to every corner and then measure the diagonals to make sure they are perfectly equal. You need to make adjustments until you get the desired result. There are a few ways to secure the 6×6 posts into place. 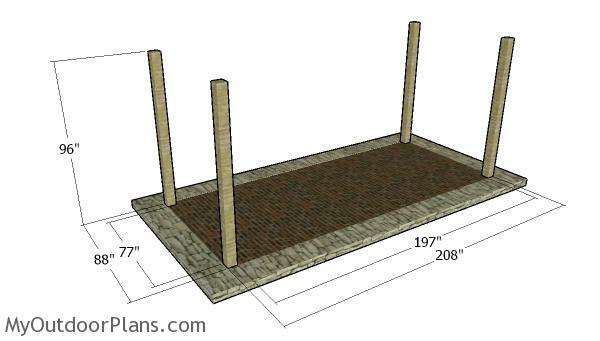 You can set the posts in concrete or you can use adjustable anchors and pour footings. Dig the holes 3′ deep (or under the front line) and about 12-13″ in diameter. Compact a layer of gravel to the bottom of the holes and then fit the tube forms. Fit the posts, align them and plumb them with a spirit level. 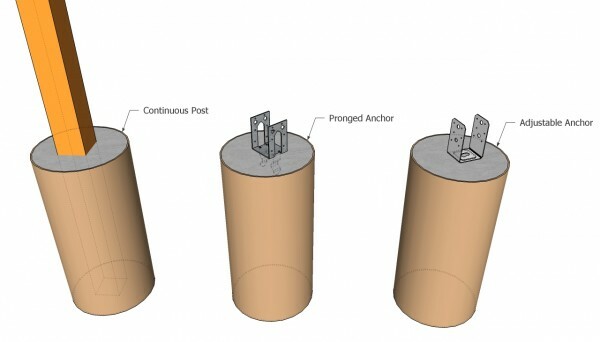 Fill the forms with concrete, while the posts are locked into place with temporarily braces. If you use anchors, you need to align and set them into concrete. Fit the posts after the concrete dries, using lag screw. Smart tip: Read the local building codes, so you dig the holes at the appropriate depth. Use 2×10 lumber for the support beams. 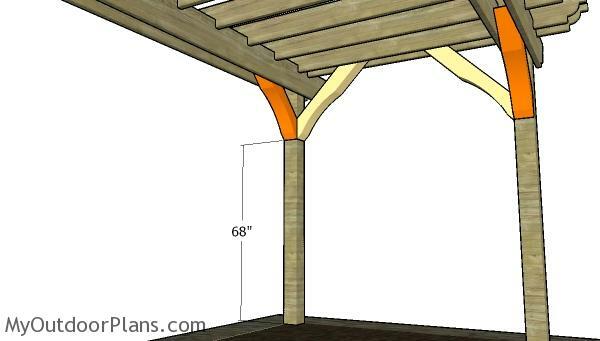 Make decorative cuts to both ends of the beams. You can use a large circular item so you can draw the curved lines. Get the job done with a jigsaw and then smooth the edges for a neat result. Fit the support beams to the top of the posts. Use a spirit level to plumb the support beams and then clamp the beams into place tightly. Drill pilot holes through the beams and through the posts. Insert the 9″ carriage bolts and then tighten the nuts. Use 2×8 lumber for the shade elements. Make the curved decorative cuts to both ends of the beams. Mark the cut lines and then get the job done with a saw. 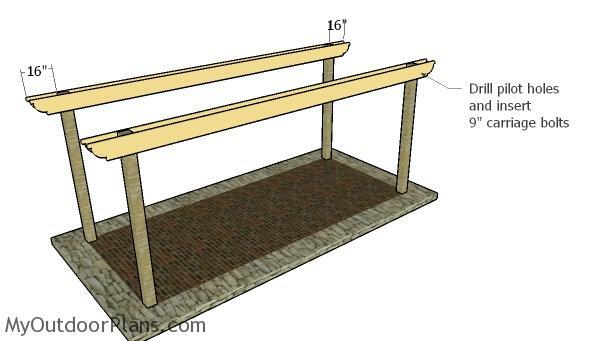 In addition, you need to make a few 2 1/2″ deep notches, so you can fit the shade elements to the support beams. Mark the cut lines on the beams and then use a circular saw to make parallel cuts. Use a chisel to remove the excess and then smooth the recess with sandpaper. Fit the shade elements to the support beams. 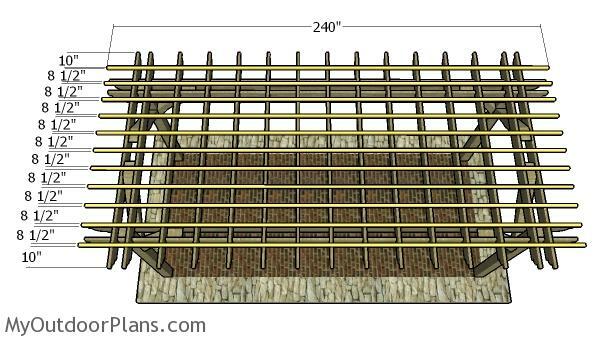 Place the shade elements equally spaced and then lock them into place with rafter ties. Alternatively, you could drill pilot holes through the shade elements (above the notches) and insert 5 1/2″ screws so you can lock them into place tightly. Use 6×6 lumber for the braces. 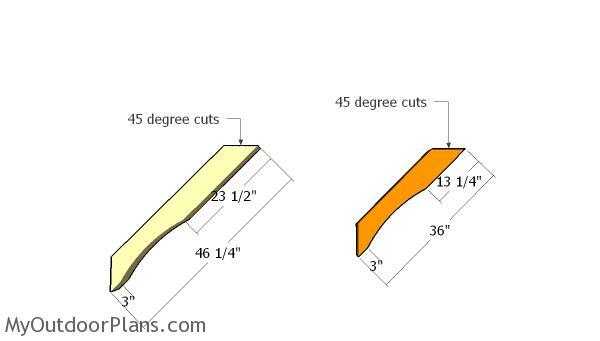 Use a saw to make 45 degree cuts at both ends of the pieces. 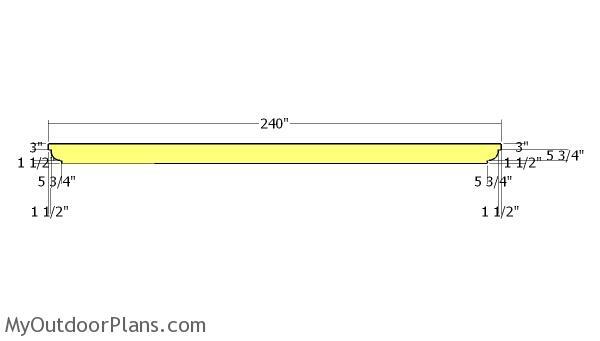 Use a spirit level to plumb the posts and then fit the braces into place, as shown in the diagram. Drill pilot holes and insert 5 1/2″ screws to secure the braces into place tightly. 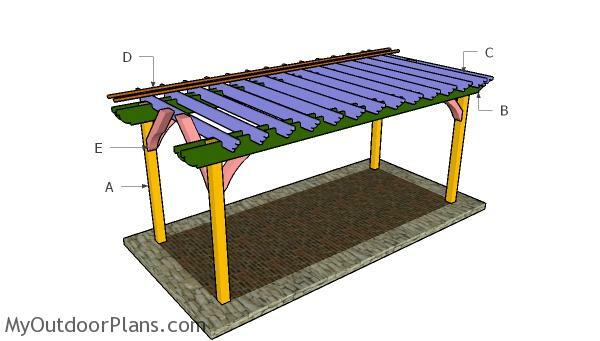 Fit the 2×2 slats to the top of the pergola. Place these slats equally spaced for a professional result. Center the slats to the rafters and then drill pilot holes, before inserting the 3 1/2″ screws. Last but not least, you need to take care of the finishing touches. Therefore, fill the holes with wood putty and then smooth the surface with 120-220 grit sandpaper. You can also fit braces, if you live in a windy area. Apply a few coats of paint or stain over the components, to enhance the look of the pergola and to protect the components from decay. This sturdy pergola provides plenty of space for setting several chairs, an outdoor sofa and an outdoor table. You can even cover the pergola of you want to obtain even more shade, especially during the hot summer days. If you want to add charm and unique appeal to your garden, I recommend you to check out these plans. 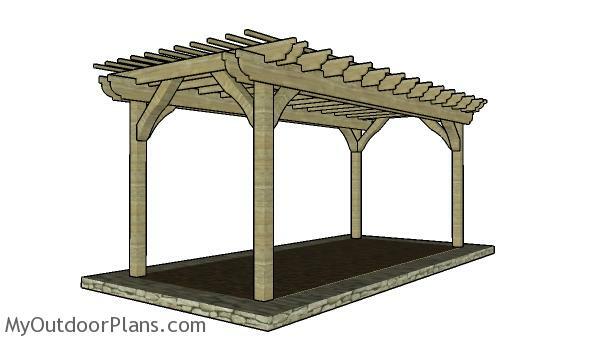 This pergola can be built by any person with basic woodworking skills and it is also very budget friendly. You can make a lot of adjustments to the design so it suits your tastes and needs. 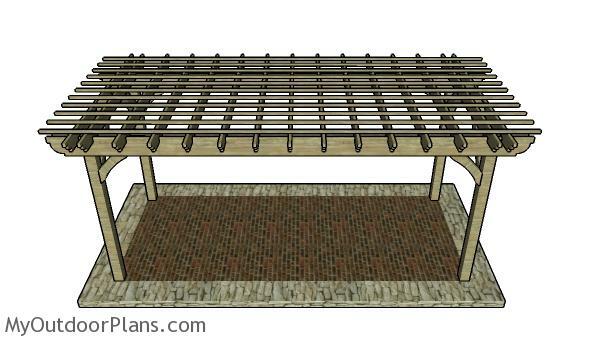 Check out the rest of my pergola plans, as I have many designed and sizes you can choose from. 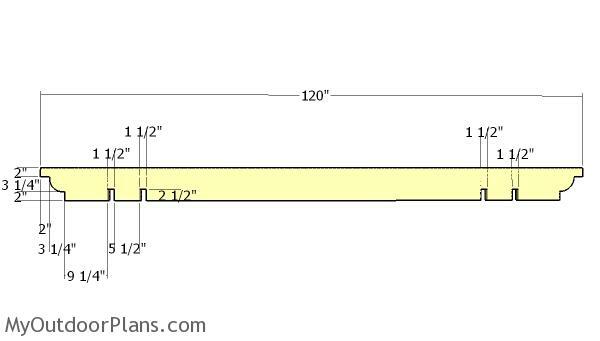 This woodworking project was about 10×20 pergola plans free. If you want to see more outdoor plans, check out the rest of our step by step projects and follow the instructions to obtain a professional result.